Rubroboletus satanas, commonly referred to as the Devil's Bolete (or by some people as Satan's Bolete) because of its poisonous nature, is a rather rare mushroom in Britain and Ireland although more common in parts of southern Europe; it is found under oak and beech trees, generally on chalky soil. All of the red-pored boletes are uncommon in the UK, but Rubroboletus satanas (until recently much better known by its synonyous scientific name Boletus satanas) is one of the rarest and is restricted to chalky parts of southern England. Throughout southern and central Europe this large and very conspicuous bolete is mainly restricted to limestone and chalk areas, where it appears under mature oak and beech trees. In the USA another red-pored, red-stemmed tubby bolete also goes by the common name of Satan's Bolete, and it is sometimes recorded as Boletus satanas. It seems most likely that the European species does not occur in America; however, a similar bolete - Boletus eastwoodiae (Murr.) Sacc. & Trott. - certainly does and it is also called Satan's Bolete. This latter species was first described in 1910 by William Alphonso Murrill (1869 - 1957), and the specific name given to this bolete is a reference to Alice Eastwood, who collected from the San Francisco area the particular samples that Murrill used in his description of the species. Murrill, nicknamed 'Mr Mushroom', was a famous mycologist who worked at the New York Botanical Garden when he was not travelling the world in search of new species. Rubroboletus satanas is a poisonous mushroom, and particularly so if it is eaten raw. 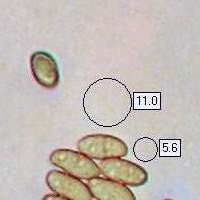 Muscarine (in very small quantities) has been found in this mushroom, but experts consider it unlikely that the concentration is sufficient to account for the reported toxicity. Other poisonous compounds have recently been isolated from fruitbodies of Suillelus satanas, and so it is - Classed as a seriously poisonous species. German mycologist Harald Othmar Lenz named and described this bolete Boletus satanas in 1831. The scientific name Suillelus satanas was given to this species in a 2015 publication by Spanish mycologist J. 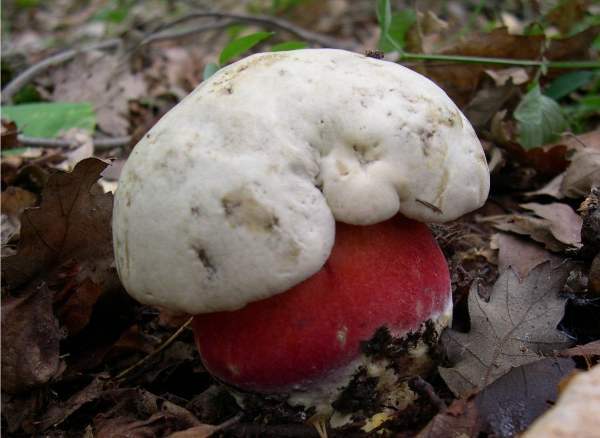 B. Blanco-Dios; hovever, most authorities now refer to it as Rubroboletus satanas, after a 2014 paper in Phytotaxa by Chinese mycologists Kuan Zhao & Zhu Liang Yang. The generic name Boletus comes ​​from the Greek bolos, meaning 'lump of clay', while the former genus name Suillelus may perhaps imply a relationship with the genus 'Suillus' - Suillus means of pigs (swine) and is a reference to the greasy nature of the caps of fungi in the genus (but not of the genus Suillelus) - confused? Me too. The current genus name Rubroboletus is a reference to the red colouring of the stem and pores of this bolete. The specific epithet satanas means 'of the devil'. 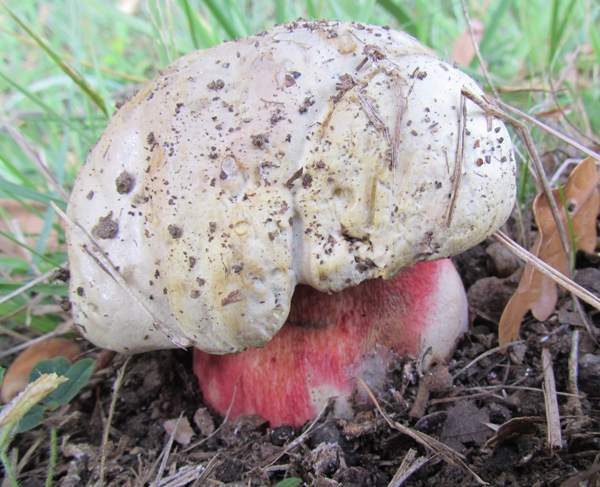 It is reported that Dr Lenz gave this bolete its diabolical name because he felt ill when he was describing it. Most people who have seen the Devil's Bolete say that it is one of the most beautiful of all wild mushrooms. Dr Lenz himself is reported to have suffered poisoning after eating this species. Significantly, however, Lenz would have been very much aware that several people who had eaten this bolete had soon afterwards been taken ill with symptoms of diarrhoea, stomach pains and sickness. Cases of poisoning due to eating Suillelus satanas are rare, and that is probably because mature specimens smell so putrid that they are unlikely to tempt anyone who has a nose. I have found only one reference to a death being attributed to poisoning caused by eating this bolete, and it is unclear whether the victim had been otherwise healthy or already weakened by some other illness. Nevertheless, and despite reports of Suillelus satanas being gathered for eating in some European countries, our clear advice has to be: 'Don't even consider eating them, either raw or cooked'. Fortunately, the distinctive chalky cap and red bulbous stem make the Devil's Bolete an easy mushroom to identify. The only common edible bolete with which it could reasonably be confused is Neoboletus luridiformis - and for that reason alone it seems sensible to leave all red-pored boletes off the menu. Neoboletus luridiformis is considered to be a good edible mushroom if properly cooked, but to enjoy it you have to get used to fungi that turn blue when cut and then almost black when cooked... and, unless you enjoy playing Russian Roulette and the like, to sleep comfortably afterwards you need to be 100% confident about the identification. Ranging from 6 to 30cm in diameter, the cap of the Devil's Bolete is chalky white and velvety at first, darkening with an olivaceous or slightly reddish tinge. 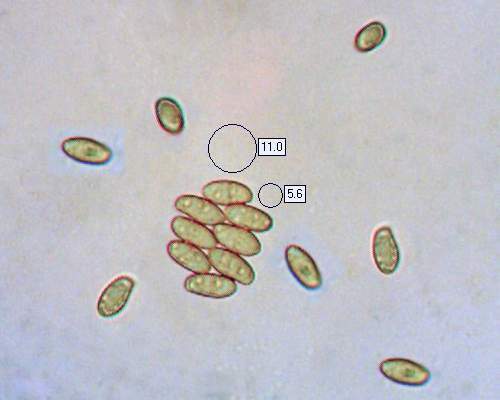 Young fruitbodies have rounded and domed caps, but with age they often develop irregularly and can become lobed. 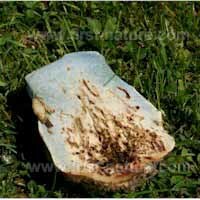 When cut, the yellow cap flesh of Suillelus satanas slowly turns pale blue and then returns to its original off-white colour. 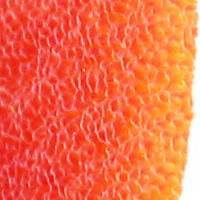 The yellow tubes terminate in pores that are yellowish in very young fruitbodies but soon turn orange and then red as the spores mature. Pores near the margin are paler than those nearer to the stem. Most specimens of Suillelus satanas develop dumpy, rotund stems. A red net pattern on a predominantly yellow-orange background on the upper stem graduates to all red at the base. 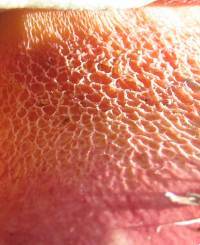 On the left is a close-up picture of the surface of a mature Devil's Bolete. 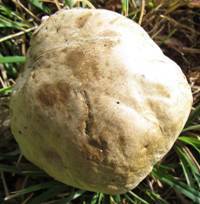 The stem flesh is off white and tends to become soft and spongy with age. When cut it blues slowly, returning to its original pallid colour with barely a trace of blue after a few minutes. Do not taste any part of this species: it is poisonous. Young specimens have a mild odour but old ones smell rather unpleasant. Suillelus luridus has a darker cap and orange flesh in the stem base; it blues instantly when cut. Caloboletus calopus has a pale cap but its pores are yellow rather than red. Roy Watling & Hills, A.E. 2005. Boletes and their allies (revised and enlarged edition), - in: Henderson, D.M., Orton, P.D. & Watling, R. [eds]. British Fungus Flora. Agarics and boleti. Vol. 1. Royal Botanic Garden, Edinburgh.